Uniformitarianism - The idea that geologic processes that occurred in the past can be explained by current geologic processes. The same processes take place on the Earth now, as did in the past. Law of Superposition - In sedimentary rock layers, a layer is younger than the rocks below it, older than the rocks above it. This can change if the rock layers have been disturbed. Principle of Original Horizontality - Sedimentary rock generally forms in horizontal layers. Thus, if layers are not horizontal, they were probably deformed by crustal movements after they were formed. If left undisturbed, the layers will remain horizontal. Graded Bedding - When sediment is deposited, large, heavy particles sink to the bottom. If they are on top, the layers may have been overturned. 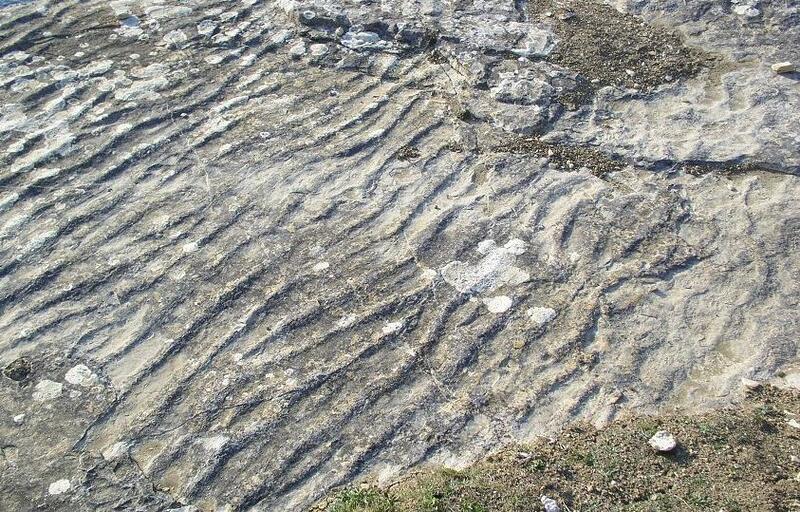 Cross-Beds - Sandy sediments form beds at an angle to the bedding plane. These often have eroded tops and curved bottoms. Ripple Marks - Small wave formed in sand from wind/water. The crests point up, if the rock was undisturbed. Unconformity - A break in the geologic record formed when rock layers are eroded or when sediments are not deposited for long periods of time. 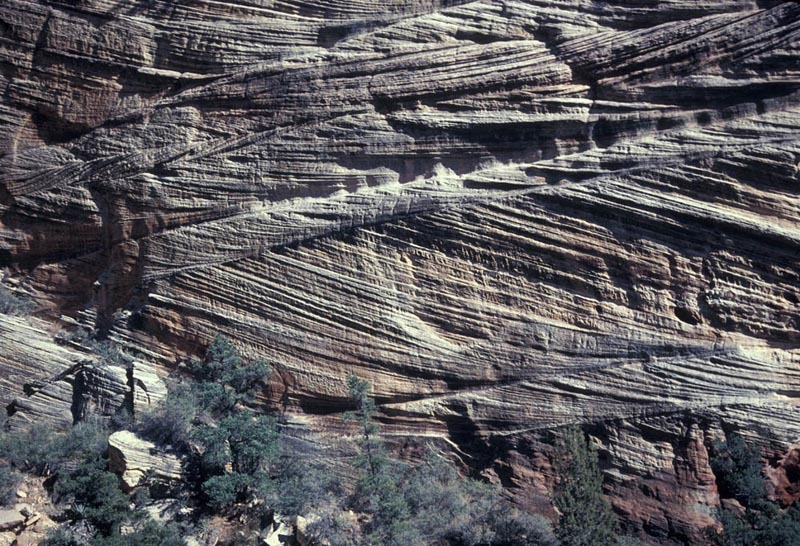 A - Angular Unconformity - Rock layers are folded/tilted and then eroded. New layers then form on top. B - Disconformity - Rock layers are uplifted without being tilted, then eroded. New layers then form on top. C - Nonconformity - Unstratified igneous/metamorphic rock is uplifted and then eroded. Sedimentary layers then form on top. Law of Crosscutting Relationships - The principle that a fault or body of rock is younger than any other body of rock that it cuts through. Absolute Age - The numeric age of an object or event. Can be used to estimate absolute age. Only practical for up to about 20,000 years. Less practical for older features (i.e. - Grand Canyon), because erosion rates vary. On average, 30cm of sedimentary rock are deposited in 1,000 years. Deposition doesn't always occur at the avg. rate. Varve - a pair of sedimentary layers (light, course layer & dark, fine layer) deposited in an annual cycle (like tree growth rings). Summer - lots of snow/ice melt, deposits lots of course sediment. Winter - as water freezes, fine silt settles out. A method of determining the absolute age of an object by comparing the relative percentages of a radioactive (parent) isotope and a stable (daughter) isotope. Isotopes - Atoms of the same element with different numbers of neutrons. Radioactive isotopes - emit particles and energy at a constant rate as they change into more stable isotopes. The amount of time it takes for half of a sample of radioactive material to break down by radioactive decay. Different substances have different half-lifes. Carbon-12 is converted to Carbon-14 high in the atmosphere (due to solar wind/radiation). Both types incorporated into CO2, which is taken in by plants during photosynthesis. While alive, plants & animals have 12C and 14C in the same ratio as they exist in the atmosphere. When they die, they no longer take in carbon. Over time, 14C decays into 14N. Scientists compare the ratio of 12C and 14C in the fossil to that in the atmosphere to see how much 14C has decayed. They can use this ratio, plus half-life, to calculate how much time has passed. Young rocks can be dated indirectly using carbon dating on organic material in the rock. Effective on materials under 70,000 years old. Fossil - The preserved trace or remains of an organism that lived long ago. Fossils are usually preserved in sedimentary rock. Occurs in dry environments where most bacteria (which cause decay) would not survive. Bodies desiccate with little rotting. Thick petroleum seeps to the surface, often covered with water. Animals that come to drink the water get trapped, eventually sink in and form fossils. High ratio of predatory animals (drawn by the struggles of trapped prey animals). Ice and frozen soil (permafrost) protect and preserve organisms - bacteria doesn't survive the low temps, or becomes dormant. Burial slows down the decay process, as it limits the amount of oxygen that can get to the dead organism. Often, the hard bits (bones, shells) are preserved. Groundwater dissolves away organic bits from buried organisms, replacing them with minerals. Creates a near-perfect replica out of minerals, such as silica, calcite or pyrite. When organic material partially decays, it leaves behind a think film of carbon which preserves the surface features. Plants (leaves, stems, flowers) and fish. Mold - An empty place left behind when a buried organisms dissolves away. Cast - A replica of the original organism; formed when sediments fill the mold and harden. Can be cut into thin sections and observed under a microscope. Tells what the animals were eating. Stomach stones. Birds and some dinosaurs swallowed them to help grind up food in their stomachs. A fossilized mark that formed in sedimentary rock by the movement of the animal in or on soft sediment. Index Fossil - A fossil that is used to establish the age of rock layers because it is distinct, abundant, widespread, and existed only for a short span of geological time. Key Bed - A rock layer that is easy to identify and found over a large area, such as the K-T Boundary. Studying the Past: Time in Geology - Lectures from an online class. Dino-Era Vomit Fossil Found in England (Article). Pg. 222-223 #6-22, 24-25, 34-36.